Size of the QSL card is 140 × 90 mm (3,5 in. × 5,5 in. ), full-colour, one-sided printing. You can choose from given designs in our gallery. On some designs, you may have your colourful photo inserted at no extra charge. Paper of flat weight 170 g per square metre keeps the quality of colourful printing while saving your money (thanks to low weight) for postage. You can write on it and it is imprintable in laser or inkjet printers without any troubles. You can choose from given designs in the happyQSL cards gallery. 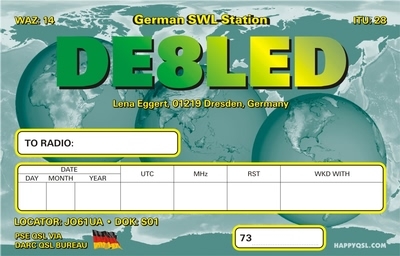 You can send us your photo, ask for individual colours (for example for the callsign), modify all the items on the sample design and add some comments (RIG, IOTA, LOC, QSL BUREAU, etc.). If you want to use labels for filling the data or imprint the data using your own printer, we can also remove the QSO box from the cards. If so, please state us your request in the "Special request" field. But realize that opportunity for changes on happyQSL card designs is limited! We can insert a logo of your club (ARRL, DARC, IOTA, etc.). Table for the listener (SWL) we of course free modify to the appropriate format, such as the following figure.